Q. So. Cut the crap! How can someone whom lots of people would regard as “past it”, write for teenagers? Let’s face it – the dude was born 1948!! A. I’m reverting. I’m having fun – having adventures… even if I can’t stay up all night any more. (Seriously, don’t get old!!) In my heart I’m having a ball now all that ‘important’ adult stuff is behind me. 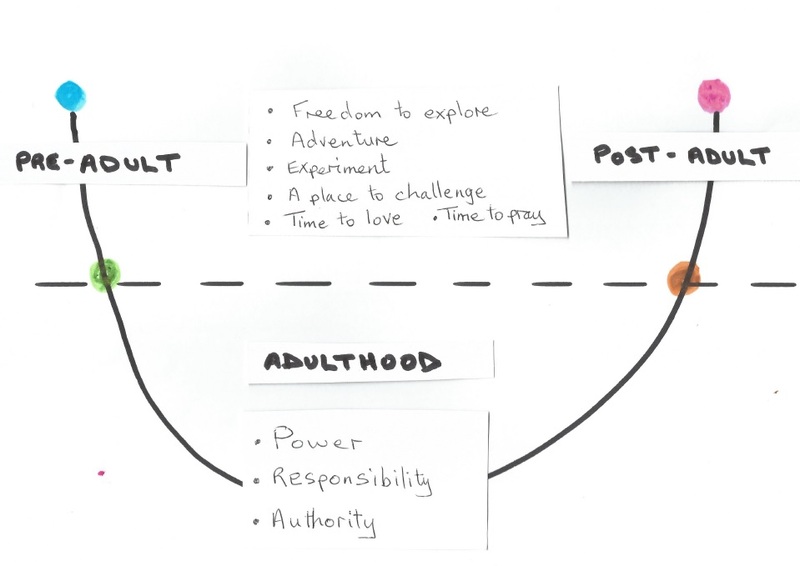 The thing is both pre-adults and post-adults are on the same side of the Life Arc (the top side). Let me explain. 1. You get born at the pink ball and die at the blue one. 3. The top part of the arc is the important bit for adults. Here the adults have power and authority. This is the place for achievement. You can judge the successful adult by the size and location of his/her house, the number and make of his/her cars, the important sounding job titles they have, and the kind of parties they go to. It’s all about making money and stuff. 4. From green to blue at the end of the arc is the slippery slope of decline when the lucky old people get to just relax, go on trips, get fat, do a bit of gardening – and then just die out of the picture. But we don’t have to have it this way up! Let’s turn it over! Here the exciting part is at the top – and the dull adult bit at the bottom. 2. The post-adult bit is the promise of life! Far from declining into a hole, it is a time to explore and adventure anew. It’s about climbing up to greater things. The pink dot (dying) becomes the gateway to new and higher freedoms that make the concerns of serious adults (stuck at the bottom of the life arc) look terribly sad. Post-adults are on the way up! When I was a teenager it wasn’t cool to believe in God – as a post-adult, (do you know what? ), I don’t care what people think. God is for real! So, granddads and grans have a lot in common with teenagers! 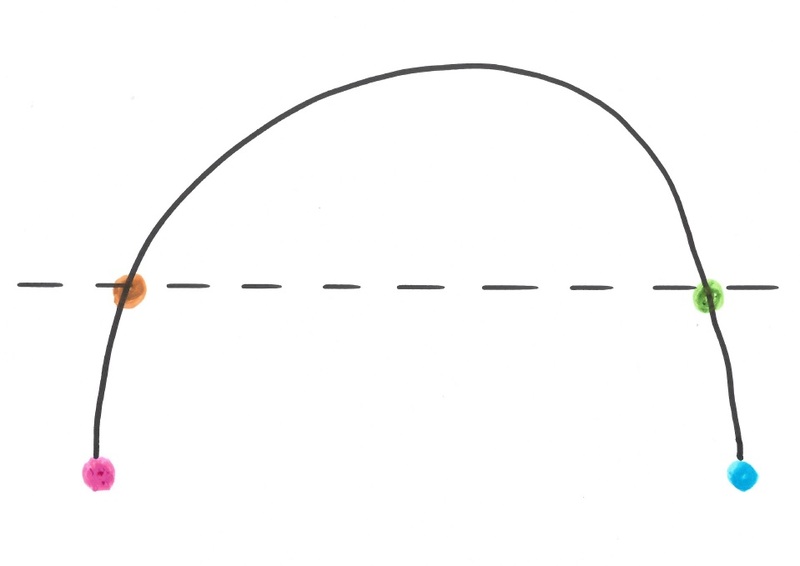 … the brown dot – but don’t try and retire too early. In fact, it’s a mistake to just regard retirement as selfish leisure – it’s making a difference in the world that makes for the best adventures. With all that wisdom and experience, a post-adult can actually make a difference for a lot of people. So, let’s join forces (young and old) to change the planet! I do hope you enjoy reading The White Gates Adventures. If you want to buy copies I can send you signed ones(!) click here or you can get it in you local library – if it’s not on the shelf, ask at the counter. If that doesn’t work and you don’t have money – let me know… and if you have any ideas for new adventures, comments on the characters, things that you want to ask about, then let me know. I would be pleased to hear from you. Contact me here. ← White Gates Adventures Teens’ Page.